Depending on where you look, gaming is either booming or in serious trouble. These 10 stats tell a lot about where the casino industry is headed. 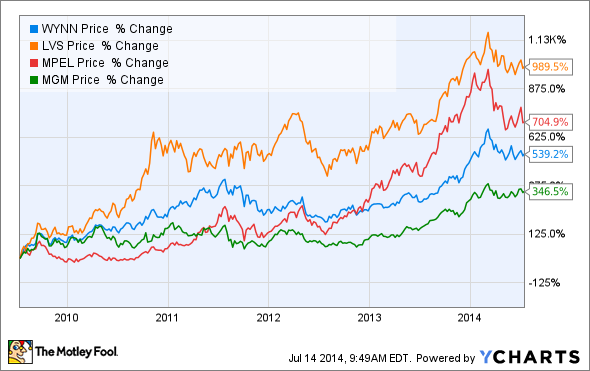 Industry-leading gaming stocks have been on a tear over the past five years. Las Vegas Sands (NYSE:LVS), Melco Crown (NASDAQ:MLCO), Wynn Resorts (NASDAQ:WYNN), and MGM Resorts (NYSE:MGM) have all crushed the market over that time on the back of incredible growth in Macau. But not all gaming stocks have had the same success. Regional gaming operators are struggling and over the weekend it was announced that Trump Plaza in Atlantic City would likely close after the city's gaming revenue fell 45% from its high in 2006. Here are a few statistics that tell you everything you need to know about where your gaming dollars should be headed. Gaming floors like this one in Macau are packed with gamblers. Source: Las Vegas Sands. $47.89 billion: Macau's gaming market generated $47.89 billion in revenue over the past 12 months. To put that into perspective, the Las Vegas Strip generated $6.52 billion in gaming revenue in the 12 months ended May 31 and the entire U.S. commercial gaming market was $37.34 billion in 2012, the most recent nationwide data from the American Gaming Association. 91.3%: The percentage of Macau's gaming revenue that came from baccarat in the first quarter. 63.4% of all revenue came from VIP baccarat. $29,457: The gaming revenue per table per day for Wynn Resorts' 492 table games in the first quarter. Las Vegas Sands generated $37,641 per table per day from a smaller 128-table base at Four Seasons Macau, and Melco Crown's City of Dreams generated $28,244 per table per day. $6,419: Wynn's win per table per day in Las Vegas. If there's any stat that shows where your gaming investments should be going, it's the difference in table game revenue between Macau and Las Vegas. Las Vegas Sands is in a similar position and generated just $3,966 per table per day in revenue last quarter. 1 in 10: Only $1 in every $10 spent in Macau is spent on nongaming activities: 90% of Wynn's revenue, 90.8% of Las Vegas Sands' The Venetian Macau, and 93.4% of Melco Crown's City of Dreams revenue came from gaming. There are a growing number of nongaming offerings in Macau, but for the most part people are there to gamble. Las Vegas is still a gambling town, but today the parties are a bigger draw than the tables. Image source: Wikipedia Commons. 1 in 2: More than half of all dollars spent in Las Vegas are spent off the casino floor. Wynn generated 59.2% of revenue from nongaming last quarter and 71.3% of Las Vegas Sands' hometown revenue was from nongaming. Today, people go to Las Vegas for restaurants, nightclubs, dayclubs, and other attractions, not just to gamble. $2.86 billion: Atlantic City's gaming revenue in 2013, down 45% since 2006. That's less than half of what The Strip in Las Vegas generated and less than one-sixteenth of gaming revenue in Macau. It also shows the impact of an increase in gaming offerings in the Northeast. Gaming outside Las Vegas in the U.S. is in very rough shape. $20.2 million: CityCenter's net loss last quarter. Nearly five years after opening the $9 billion resort, MGM Resorts' massive development in the middle of the Las Vegas Strip continues to report financial losses. On the bright side, the resort did post $95.1 million in adjusted EBITDA, so there should be a small amount of cash flow from it. $262: Daily average room rate at MGM Resorts' Bellagio resort in Las Vegas. By comparison, Circus Circus commanded just $63 per night. The higher-end Wynn Las Vegas commands $275 per night and The Venetian charges $241 per night. The high end of Las Vegas is largely recovered from the recession while the low end is still struggling. 6 and 2: The number of gaming concessions given in Macau and Singapore, respectively. Both regions are incredibly profitable for gaming operators and that's in large part due to the fact that supply is limited to a small number of companies and casinos. By contrast, the U.S. has opened up supply in recent years and seen profits fall. This exclusive club includes U.S.-traded companies Wynn Resorts, Melco Crown, and MGM Resorts in Macau, and Las Vegas Sands, which has casinos in both Macau and Singapore. Next time you're looking at gaming stocks, keep these statistics in mind. They may keep you from making a bad bet.